Don Troiani's "The Last Salute"
I think Gary Gallagher makes a pretty good case for why black soldiers were not present at the Grand Review in Washington D.C. in May 1865. He argues that their absence had little to do with scheming politicians and military brass, who hoped to keep it an all-white affair. The parade was made up primarily of units that were in the process of being demobilized. Since black units were raised later in the war they remained stationed in various parts of the South. In contrast, black troops under Edward O.C. 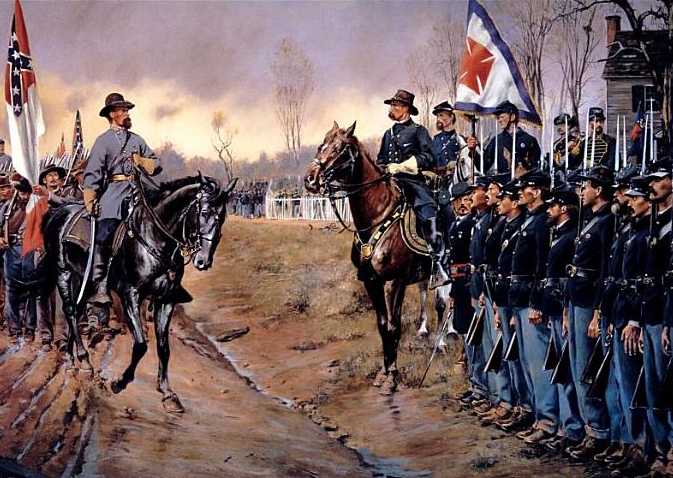 Ord’s command were at Appomattox Court House in April 1865. Anyone who has read William Marvel’s books on the march out of the Petersburg trenches and surrender knows that these units were kept in camp behind their white comrades once the Army of Northern Virginia surrendered. Before the surrender ceremony on April 12 these men were ordered away from Appomattox. Marvel suggests that this was done “for the sake of serenity.” That seems like a reasonable explanation. One wonders how their presence might have shaped an account of a salute that may or may not have taken place. Did USCTs particpate in any of the CSA surrenders? Johnson in the Carolinas, or Kirby Smith in the TransMississippi? According to Joshua Lawrence in The Passing of the Armies, written 50 years after the event, altho’ there were no Black troops in the Grand Review, Sherman’s army was accompanied by both liberated slave families (which makes a nice contrast with Roman triumphs featuring the newly-enslaved) and Black labourers attached to the army. Presumably the latter did the sort of work done by slaves for the Confederate armies, but no-one has ever claimed they were soldiers. Thus, the three pioneer companies of the 110th USCI were the black pioneer units Sherman, Chamberlain and others refer to in the Grand Review. They were mustered soldiers. They may not have had uniforms, as the unit records indicate they literally worked them to shreds, corduroying roads in the swamps of the Carolinas, and they might have chosen to march with their tools, because the soldiers surely knew who had built the roads they marched over, and the entrenchments they fought behind, and carrying their axes and shovels would serve as an identity badge. But they were mustered soldiers, just as engineer troops are soldiers today.